But what if you could digitize some of those parts, find them with a quick keyword search, and print them on demand? Wouldn’t that be even more magical? And the truth is, you don’t always find what you’re looking for either. Maybe you have an antique part made using some long-discarded standard. What then? Home improvement giant Lowe’s believes 3D printing may soon be a key piece of the hardware supply chain. And they just announced they’re taking a first step toward that future by debuting scanning and 3D printing services at an Orchard Supply Hardware store in Mountain View, California. One of my first daydreams about 3D printing was having an entire hardware store at my fingertips—need to replace that doorknob or lost a screw? No problem. Download and print it on your desktop 3D printer. A 3D printer in every home is a nice dream, but for experts, it’s also likely a bridge too far. 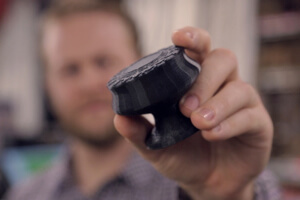 To create their new service, Lowe’s partnered with 3D printing software and services firm, Authentise, a Singularity University Labs company they met through the SU Labs corporate innovation program. I spoke with Authentise CEO, Andre Wegner, about the project and 3D printing in retail. Wegner says other than plastic trinkets, it isn’t realistic to expect people to keep all the necessary materials on hand at home to make quality prints in the future. Instead, he expects a “hub-and-spoke” model, where local 3D printing shops are the first point of contact for most people. Enter Lowe’s. The new Orchard Supply Hardware 3D printing service is comprised of three key parts: scanning, 3D printing, and perhaps most importantly, access to a dedicated in-store design specialist. Orchard Supply Hardware 3D printing kiosk. Wegner says that, although 3D printed prototypes have been around for a few decades, 3D manufacturing is still young—no more than ten years old. Unless you’re a hobbyist or engineer, the learning curve can be steep. Therefore, to get the most out of 3D printing, access to a good machine and expert guidance are critical. Orchard Supply Hardware customers can choose from various template objects—light switch plates, address plates, door handles, cabinet knobs—and customize and 3D print them. Or if they want to print items from materials other than plastic (e.g., ceramic or metal), they can order them for pickup or delivery. Alternatively, they can bring in hard-to-replace or rare items (perhaps old or non-standard designs) and scan them. Lowe’s and Authentise will take these files and connect with freelance designers to clean them up for printing. Customers can also order and 3D print items online at Osh.com. What can people do with a 3D printer they couldn’t do any other way? “The mind boggles,” Wegner says. “I often go through rooms and think—all these things that are impersonal and standardized, mass customized in China maybe.” Beyond objects that aren’t turned over often or rare parts that aren’t manufactured anymore, a central strength of 3D printing is customization. “The home is very personal and 3D printing gives homeowners unprecedented access to build items that reflect their individuality,” says Kyle Nel, executive director of Lowe’s Innovation Labs. “We are bringing customers an approachable and affordable customization experience.” It’s an exciting prospect. But will we eventually customize and 3D print every item you might find in a hardware store? Wegner says no: “Objects that have large production runs are unlikely to be 3D printed.” It doesn’t make economic sense. That said, the number of 3D printable items will greatly expand. And it won’t be simply about reproducing traditional parts—rather, we’ll begin designing with 3D printing specifically in mind. New parts won’t look exactly like the old ones, but they’ll perform the same function as well, or better, than traditional items. So, that desktop replicator? Not yet. But with this partnership between Lowe’s and Authentise, access to more widely distributed 3D printing, scanning, and design expertise may soon be within reach.